Join the best of the best in recreational scuba diving and live the ultimate dive lifestyle as a PADI Junior Master Scuba Diver. The PADI Junior Master Scuba Diver rating puts you in a class of distinction – writing your ticket to endless adventure and opportunities through the experience and scuba training that sets you apart. After completing CPR and First Aid and the PADI Junior Rescue Diver course, you should take the PADI Emergency Oxygen Provider course. 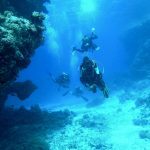 Together, these three courses round out your ability to handle scuba diver emergencies, AWARE-fish identification, boat diving, drift diving, night diving, peak performance buoyancy, search and recovery, underwater navigation, underwater photography.